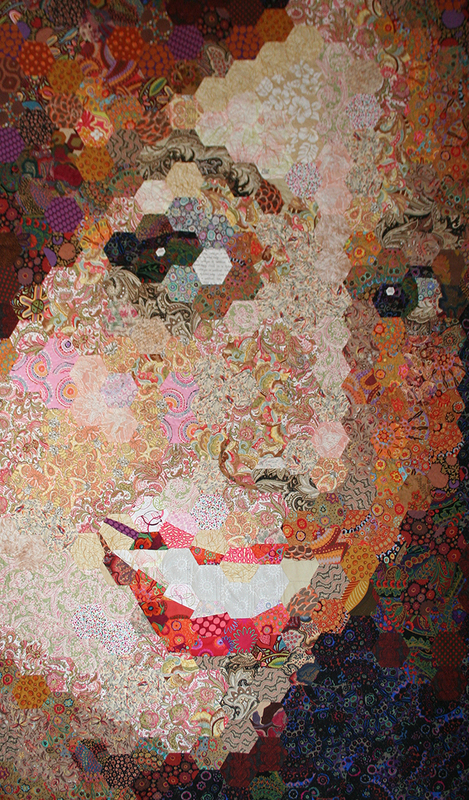 So thrilled my art quilt “Kirsten” is in ArtPrize 9, a huge international art competition in Grand Rapids, Michigan! “Kirsten” (named after my daughter) is 54 inches wide and 81 inches tall. I created it by sewing together 480 fabric hexagons by hand, using the English Paper Piecing technique, which involves wrapping paper shapes in fabric and then stitching the fabric together. Approximately 60 different commercial fabric prints were used. I quilted it using mono-filament thread on my home sewing machine. I’m often asked how long it took me to make. I don’t really keep track, but I would guess almost 200 hours total. I probably spent about 80 hours over the course of 4 weeks creating fabric hexagons and carefully choosing the placement of each hexagon on my design wall, guided by a reference photo. I didn’t start sewing anything together until all 480 hexies were in their final location and orientation. Then I probably spent 100 hours over the course of 2½ months hand-sewing the hexies together (being careful not to rotate or disorder anything!) Quilting and binding took about 10 more hours. I hope you can see it in person, on the upper level of the Gerald R. Ford Presidential Museum through October 8, 2017. Please view it from a distance as well as close up – I think the difference is amazing! If you agree, I’d love your vote! Please use code 64662! The art quilting group I belong to held a “brown bag challenge.” No, we didn’t make quilts out of brown bags! We were each given a plain brown paper lunch bag and asked to put three items into it, with which a small 12″x12″ art quilt could be made. We exchanged bags anonymously and had two months to create something artful for the contributor. The bag I selected contained three pieces of fabric – saturated hand-dyes in cherry red and marine blue, and some Kaffe Fasset Shanty Town in the same colorway — and some green perle cotton floss. I decided to do a modified “stack and whack” with that house print. Stack-and-whack usually involves cutting 8 identical triangle blocks and rotating them to form an 8-sided kaleidoscope effect. I only had 4 repeats of the pattern available, so I cut tiny 1.5″ squares, rotated them and joined them to form 2″ finished sized blocks. I added some of the red, because it had nice directional streaking, and a bit of complementary Kaffe fabric from my stash. I arranged the tiny blocks in a corner-to-corner color wave from blue to purple to red, with fun pops of green from the prints. But I wasn’t finished. The agreement was to use a recognizable amount of each of the contributed items. I still had green embroidery cotton to feature somehow. I needed to sleep on it again. So many angles in that Shanty Town print. So many squares in my piecing. The quilt needed something soft, curvy, organic. And I could introduce that with embroidery. I chain-, blanket- and feather-stitched an insect-like web right over that angular grid of whacked houses. I kind of love the results.